Portrait of the Community as a Block will focus on the stores where people work and shop—the bodega, hair salon, dollar store, take-out restaurant, and, of course, laundromat. Together with Hunts Point residents, Jones will record stories, anecdotes, jokes, urban legends, and histories about their experiences buying and selling in the neighborhood. They will produce still, video, and audio portraits of people working and shopping on the block. The project will culminate with a photographic, audio, and video-based exhibition of community portraits at a Hunts Point laundromat. Art Jones works with film, digital video, audio, and hybrid media. His films/videos, live audio/video mixes, and installations often concern the interrelationships between popular music, visual culture, history, and power. 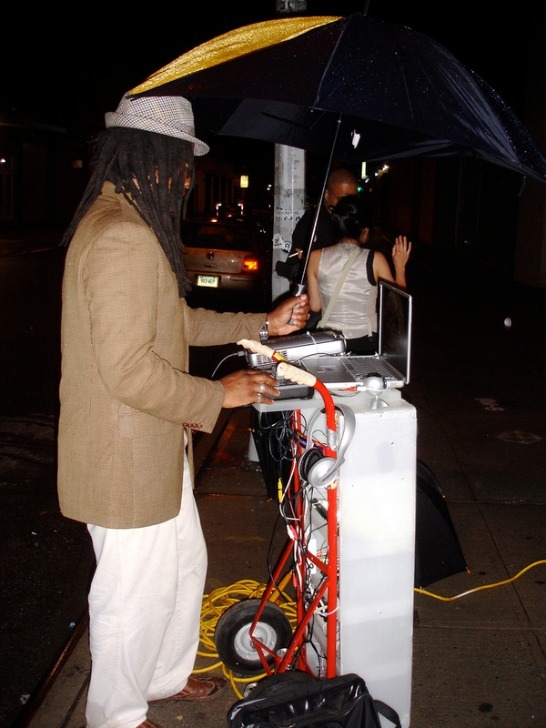 He has collaborated with musicians and artists including Soundlab, DJ Spooky That Subliminal Kid, Philipp Virus with Alec Empire, Teleseen, Amiri Baraka, Femmes with Fatal Breaks, and Anti-Pop Consortium. He has been doing public and community-based projects and engaging with diverse audiences in many places, including New York, New Orleans, Osnabruck, Hong Kong, and Karachi.